This is the first island exploration event of the Nyroth arc, in which Bilgewater will explore the lost isle of Avalon. 2 November, 24 CLE—Nami and other delegates of Bilgewater are granted an audience with the winged denizens of the floating city above the ruined continent of Nyroth, with the League as mediator. She declines to mention their belief that the cataclysm which destroyed Nyroth was caused by an aftershock from Valoran’s Rune Wars; it is not yet clear whether or not the League’s Summoners have shared this revelation with the Nyrothians. The League indicates that the four northeastern islands, from Avalon to Daeyux, have been opened for potential exploration. Nami asks the Nyrothians for further guidance as to what these islands may contain. She explains that this is not merely a matter of curiosity. She tells them of the plight of the Marai, and their fading moonstone, whose dwindling light provides less and less protection from the monsters of the depths with each passing day. 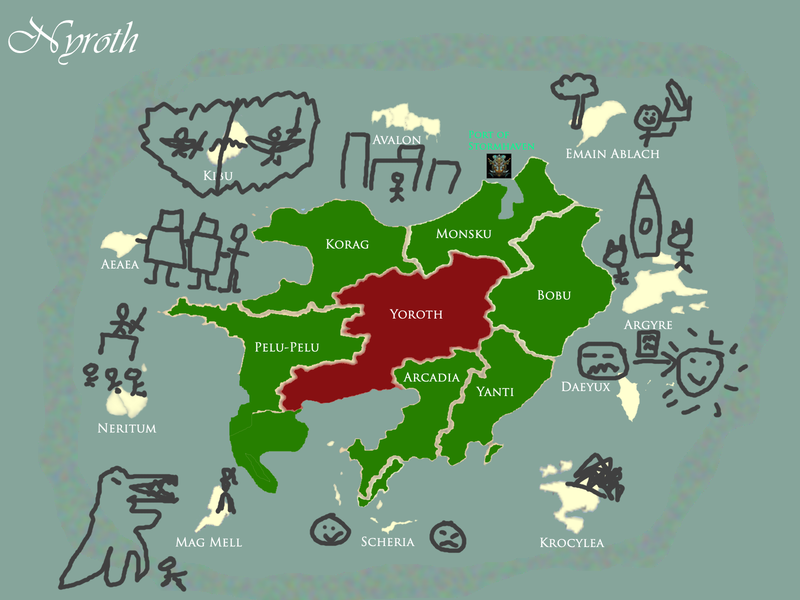 The Nyrothians admit that they know little of these islands. The cataclysm was nearly a thousand years ago, and they possess only scraps of oral tradition and largely incomprehensible bits and pieces of intermingled history and legend. Nor have they been able to decipher the language of the ancient Nyrothian, who has fallen into a catatonic trance. The League’s Summoners have tried every translation spell known to Valoran’s sages, with little success; it is theorized that the thaumic shock of the cataclysm may have somehow blocked that part of the world’s ethereal thought-space. It produces all things of itself; the fields there have no need of the ploughs of the farmers and all cultivation is lacking except what nature provides. Of its own accord it produces grain and grapes, and apple trees grow in its woods from the close-clipped grass. The ground of its own accord produces everything instead of merely grass, and people live there a hundred years or more. When Bilgewater surveys Avalon from loaned Zaunite zeppelins, it sees only two structures: a massive factory complex in the center of the island, and a ruined city off to the east. It seems as though every other trace of civilization has been scrubbed away from the now-desolate heights that bound the valleys of Avalon with immense canyons. Most of the valleys are now filled with automata powered by some advanced form of hextech. There they operate massive farms. Grain is harvested and baked into breads and pastries; fruit is picked and processed into jams and jellies; animals are slaughtered and their meat diligently prepared. All this plenty is then carried out to what appear to be shops, which have many automata attendants but no customers. Periodically, other automata come to gather food that has gone bad and carry it off to compost heaps. An initial attempt at communication nearly turns disastrous, as police automata immediately attack and force the “intruders” to flee back to the skies. The situation appears different in the valleys near the ruined city in the eastern region. These valleys are heavily fortified by some kind of advanced earth magic. Immense walls of stone and metal block off the entrances and exits, allowing only narrow inlets for water from the streams and rivers. Thick crystalline shields span these canyons, forming a kind of fortified ceiling that looks as though it admits only dim light. The Nyrothian inhabitants are wary at first, but also visibly astonished to see others like them. Bilgewater’s explorers are allowed entry into one of the settlements. They find the people within struggling to survive; with the crystalline ceilings blocking much of the sun, few crops will grow. They tell of several famines within recent memory, brought about by uncontrolled surges in the geomancy that strengthens the fortifications but crushes the life out of the soil. As for the fortifications themselves, they explain that they are under constant attack from berserk automata: just last week, several of the machines forced open the gates covering the stream inlets and slew fourteen of the valley’s defenders before they were themselves destroyed. They seem dimly aware that other inhabited valleys exist, but apparently have very little contact with them. As for the ruined city that looks down on these inhabited valleys, it is filled with automata. These ones do not seem mindlessly hostile: in fact, they speak intelligently when approached, and name their city as Padonia. They explain that they used this city’s magical defenses to protect the inhabitants of the nearby valleys from the deranged automata that went berserk during the cataclysm. They add that they do not consider themselves to be at the command of these people, as they are “programmed” only to obey the government of Avalon, which was quickly massacred during the cataclysm. They confirm that the factory at the center of Avalon is the source of the berserk automata that threaten them and the surviving Nyrothians: apparently, the other cities on the heights were dismantled piece-by-piece for spare parts by the factory’s scavenger teams. The Padonian automata show considerable contempt for the humans they watch over. They say that they have degenerated into savages, too xenophobic and selfish to ever come together to work their own liberation. For centuries they have watched the automata sacrifice themselves to save their wretched settlements, and yet all attempts at communication have been answered with unthinking hostility. There are no heroes left among their kind, an automata with the designation Awaoi-01 declares of the Nyrothians in the valleys. But, seeing the Champions and Summoners of Bilgewater, he admits that perhaps humanity still has heroes in this far-off place called Valoran, and perhaps that is enough to restore hope. Avalon, once a jewel of Nyrothian culture and progress, was all but destroyed in the cataclysm when its automata went berserk. Once, its rocky heights were covered in sky-scraping buildings; now, all have been stripped bare by the automata, leaving only the factory producing the deranged machines in the center of the island, and a lost city in the east (Padonia) held by a small number of automata that somehow were not affected. Most of the fertile valleys between these canyons are now controlled by automata. A few valley settlements still survive; their people have used remnants of Avalon’s geomancy to encase them in rock and crystal. It is a meager existence, but it keeps the marauding automata out—mostly. Bilgewater has the following stats. Consult the island exploration rules for more information. Snoop around looking for something interesting. Unify the survivors and the non-crazy automata into a defensive alliance. Launch an all-out assault on the factory that’s producing the berserk automata. They decided to go for the riskiest and most dangerous option, the assault on the factory. Here’s how the dice rolls played out. The narrative version follows. Bilgewater decided to risk Twisted Fate and Gangplank on this adventure, giving them bonuses but risking the loss of these Champions for a week of matches. Bilgewater’s Summoners convinced the surviving Nyrothians to come together with the Padonian automata. Bilgewater would stand beside them both in the battle to come. Seeing their first true chance for freedom and happiness in a thousand years, they agreed. Bilgewater had an option to significantly weaken the factory’s automata by conjuring up a disruptive magical shockwave. Bilgewater is not that great at the sciencing, even with the Marai there to help, and failed. Twisted Fate rolled a critical success (appropriately enough) on his mission to plant bombs in the factory. The blast destroyed some of the automata before the battle, evening the odds somewhat. Bilgewater’s troops led the Nyrothian survivors and the automata from the ruined city of Padonia to the factory. This drew the berserk machines out into the open, where a truly devastating barrage of cannonfire from Gangplank’s pirate fleet (RNG OP!) drastically reduced their numbers. Seizing their opportunity in the wake of the bombardment, Bilgewater’s swarthy buccaneers charged into the fray alongside their Nyrothian allies and obliterated the enemy automata. The factory was finally put out of commission. Bilgewater itself suffered no serious casualties, though many Nyrothians and automata did perish in the battle. Injury checks were rolled for both Twisted Fate and Gangplank. (There is a 10% chance of a Champion being injured in battle.) They both passed. Avalon’s nexus was discovered beneath the central factory. This was a difficult challenge for Bilgewater, not being a very strong Research faction (to put it mildly). However, they rolled another crit, and with the help of the Marai they brought along (a prize for their victories in the first part of the arc) they just barely pulled it off. The subnexus has been realigned to the way it was before the cataclysm, enabling the denizens of Avalon to once again invoke the full power of their magic and rebuild their long-destroyed cities. Gangplank timed his fleet’s bombardment with devastating precision, catching the enemy automata at their moment of greatest vulnerability. The Padonian automata seized control of the guard towers overlooking the factory, and from that vantage point they fired hex-charged steel bolts down on the enemy. Awaoi-01 vanished shortly after the fighting began, last seen moving in toward the factory. The Nyrothians were utterly naive to the practice of organized warfare, but by attaching their warriors to units of Bilgewater mercenaries they were able to maintain unit cohesion and secure a foothold around the factory’s periphery. Their slow progress across the battlefield was mercilessly punished when an enormous artillery piece mounted atop the factory’s roof clattered online. The first volley of explosive grapeshot killed hundreds of Nyrothians, and many more panicked and fled. Only a single valley’s warriors held fast. The Padonian automata placed themselves in the line of fire to cover their advance on the factory’s main entrance. Awaoi-01 was spotted again on the rooftop, his armor fractured and his weapon arm nonfunctional. Struggling with the automata guards surrounding the turret, he watched helplessly as the weapon fired a second time, with horrific effect upon the others from his machine-city. Only then, a few precious seconds too late, did he disable the great weapon by hurling one of the factory’s automata into the gun’s power conduit. The blast threw him from the rooftop, down onto the scorched battlefield. Their position was lost. The Padonian automata who had been their front line were badly damaged, most no longer able to stand. Twisted Fate made an ominous remark couched in obscure card-game terminology. Gangplank took a swig from a bottle of his self-branded citrus-infused rum, Saltwater Scourge, and with a seemingly careless flick of his wrist fired his last loaded pistol, piercing the neck joint of one of the advancing automata and blowing its head completely off its body. The surviving Nyrothians huddled in the center, with their shaking hands barely keeping a grip on their weapons. As their defenders drew melee weapons and braced for close combat, Awaoi-01 spoke to the Nyrothians in his cold metallic voice: “Is there no one who will stand up and try to fight? Is there not one in all your ranks? Is there no one who values courage over life?” Twisted Fate made a further remark in folksy Bilgewater slang which very few present were equipped to understand, then exhibited his roguish charisma by manipulating the tilt of his hat and flourishing one of his magical cards. One of the Nyrothians rose, gripping a heavy forge-hammer—which he almost at once tossed aside. Twisted Fate said something which may have included a phrase such as “an ace up our sleeve” when, to his surprise, he sensed an enormous surge of magical power from the empty-handed Nyrothian, who was named Tokos, and came from the Blandlake settlement. A swarthy sailor-Summoner named Bystan, who lay unconscious after receiving serious injuries fighting alongside Gangplank and Twisted Fate, was suddenly awakened. His eyes were still half-closed, and his weathered face slack, as he reached out and slashed the air with swift-drawn spell-figures which any Summoner past the 20th Level would recognize: the final hexes that activated the link between Summoner and Champion on the Fields. It should have had no effect whatsoever—such an incantation was meant to be used atop a well-inscribed rune circle, and had little meaning but to activate such an arrangement of arcane symbols. But there was something about the precisely ordered thaumic matrix in the foundations of Nyroth and its islands, the same matrix that enabled the ready creation of sentient automata and other marvels of Nyrothian techmaturgy, that allowed the half-conscious invocation to come alive. Gangplank and Twisted Fate, often summoned by Bystan on the Fields of Justice, were instinctively pulled into the nascent connection—and discovered it was anchored to Tokos. Through the link, they could sense the tremendous power surging up from the ground into Tokos, far more than any ordinary mortal could absorb without being instantly destroyed along with any Summoner foolish enough to channel so much energy into so fragile a vessel. “Stand with me!” Tokos shouted, and his people stood to fight with their Champion. He intercepted an automata’s blow aimed at Awaoi-01, deflecting it into an armlock. The berserk machine strained uselessly against the newly empowered warrior, who seized its neck before wrenching it apart with a lifting twist. The Nyrothians rushed after him, fighting with renewed fervor, and a new melee began. Tokos wove through the ranks, smashing the mechanical titans apart with his fists and feet, bare limbs hitting with many times the force of his discarded hammer. It ended when Awaoi-01 grappled the last rogue automaton, and with only a brief look to Tokos, cast it before him. The Nyrothian valley-dweller crushed its metallic chest with a stomp of his boot. Over the screeching din of the murderous construct’s dying machinery, Tokos proclaimed victory. His people cheered, thronging about their new Champion. Summoner Bystan fell unconscious once more. As the moon ascended into the Nyrothian sky, the arcane fires creeping along the ruins of the factory guttered out. Looking around, Bilgewater’s Champions and Summoners, and their new allies, found themselves seemingly surrounded by faint figures. The wind howled as the figures drew closer, wreathing them in eerie black mist. Against this dark shroud, their glowing features could at last be distinguished. The Nyrothians fell to their knees, weeping at the sight of these gaunt spectral faces; these were the restless spirits of tens of thousands of their kin who had fallen to violence, famine, and disease in the dark centuries that followed the cataclysm. The spirits seemed almost not to notice the living, instead reaching down to offer their hands to the souls of those who had been slain in the assault on the factory as they arose from their still-warm bodies to join the throng in joyous embrace. The black mist fell back to the sea, and the ghosts of Avalon disappeared from mortal sight. Tokos cast his eyes about the crowd searching for Awaoi-01, but the automaton was gone. Only at the very periphery of his Summoner-sharpened hearing could he detect the steely-cold notes of an ancient Avalonian work song, whistled into the night air somewhere far from where he stood. Could Bilgewater acquire military aid from other faction? Maybe from a faction wishing to apologize for a hasty and ill-advised politics vote last week? This is definitely a planned feature. I decided to leave it out of Avalon, though, to keep things simple. Avalon is mostly a test-run. My current plan for assistance from other factions: have each faction indicate the circumstances under which they’d help (e.g. even share of the loot, for free, small compensation, etc.) and then have the primary exploring faction indicate (for each other faction) what terms they’d accept. If there’s overlap, a deal is made. However, I’m concerned that may be too complex. It’s also problematic in that, e.g., Ionia might decide while exploring an island “we’ll do the super-dangerous option, but only if we’ve got some backing from the others.” We’d need to work in some conditional logic. Anyway, keeping it simple to start with. The Shadow Isles have a spooky seance coming up Soon™.